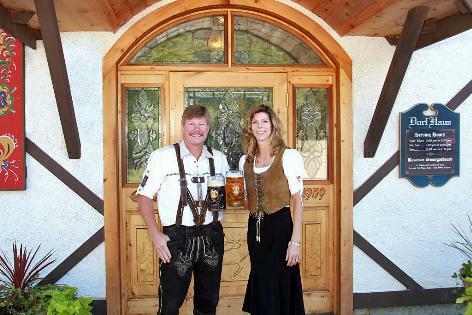 Nestled in the quaint German village of Roxbury, an old world atmosphere awaits you at the Dorf Haus. Decorated with authentic antiques, paintings of famous German castles and Kings, and breathtaking stained glass, the Dorf Haus will enchant you. Our extensive menu offers a variety of authentic German and American specialties that will satisfy the most discriminating palate. From wiener schnitzel, sauerbraten, rouladen, & pork shank to prime rib, bar-b-que ribs, duck, & our famous family style chicken, you will find only the best meats and freshest ingredients are used in preparing your entree. From a menu which was once comprised of family style chicken and fish to today's extensive menu, the Maier's have not forgotten what good food and service are built on.